Eclipse editors allow you to place a book mark on any line within the editor. 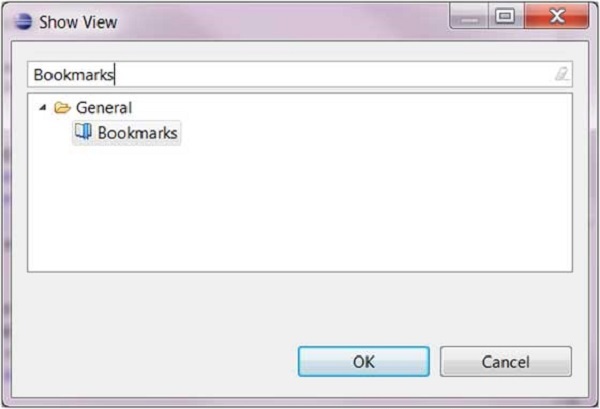 You can use bookmarks to serve as reminders and quickly navigate to any line in a file. To set a bookmark, right-click on the vertical ruler near the line on which you want the bookmark and select Add Bookmark . In the Add Bookmark dialog box enter a name for the Bookmark. A bookmark icon appears in the vertical ruler. Also, a row is added to the table in the Bookmarks view. In the filter text box enter Bookmark. The Bookmarks view shows bookmarks placed in resources across the workspace. Using the Bookmarks view you can navigate to a bookmark by double clicking on a bookmark or right clicking on a bookmark and selecting "Go to" menu item.